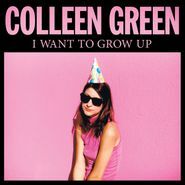 Colleen Green details major life upsets as she faces the end of her 30s on her new album, I Want to Grow Up. From breakups to digitally addled attention spans, Green’s power-pop panache makes quarterlife crises go down smoothly on hooky songs like “Pay Attention” and girl-groupish “Wild One.” “I’m so sick of being self-absorbed,” Green sings on the title track, yet she’s so good at communicating that sense of staring at the ceiling and chastising yourself that we can’t help but be hooked on her particular brand of sugary anxiety. She writes a catchy ode to getting clean and going to bed early with “Things That Are Bad for Me” and then follows it up with another track about wanting to get fucked up on the drone-rocking “part 2,” summing up a sentiment on this album we can all relate to: I’m gonna get it together, maybe tomorrow. Read more about I Want to Grow Up in our interview with Green here. See her live at Amoeba Hollywood today at 7 p.m.! Most artists, as their lifelong music careers develop, tend to taper off in terms creating new material. Not longtime Vallejo rapper/Bay legend E-40 whose latest release in another multi-album release - the triple CD set Block Brochure: Welcome to the Soil 1, 2 & 3 that offers a stunning total of 60 new tracks! (You can buy as three individual CDs or as a single packaged 3CD set for $34.98,including free shipping, from Amoeba..com. ) 60 new tracks is a lot of new music from the ever innovative Bay Area legend whose been putting it down for a quarter of a century now and showing no signs of ever slowing down. In that same unique position (especially for rap music in which careers don't traditionally last beyond one decade) is fellow Bay Area rap pioneer Too $hort who is similarly prolific and even longer in the game - clocking three decades into his long successful career. Recently Too $hort released his 19th album No Trespassing (Dangerous Music) on which coincidentally E-40 makes a cameo. Another longtime Bay Area hip-hop artist with a new release is the Quannum Projects' Gift of Gab who just relased The Next Logical Progression. Check music sample of this and all the chart entries in the videos below.